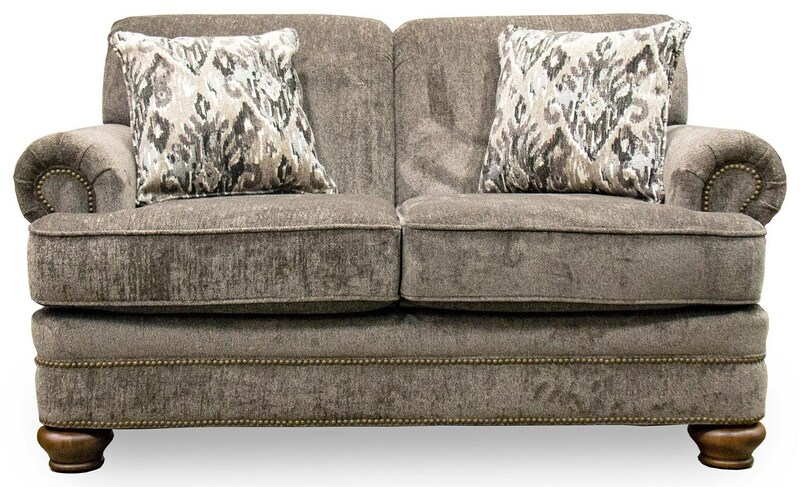 Traditional elegance is epitomized with this loveseat's rolled arms, scrolled back, bun feet, and nailhead trim. The Reed Traditional Loveseat by England at Great American Home Store in the Memphis, TN, Southaven, MS area. Product availability may vary. Contact us for the most current availability on this product. Seat Support Seat construction is webbing. Padding & Ergonomics Cushions are block foam with polyester fiber cap. Furnish your living room with the distinctive traditional style of this collection. Each piece is available without nailhead trim or with optional nailhead trim. The Reed collection is a great option if you are looking for Traditional furniture in the Memphis, TN, Southaven, MS area. Browse other items in the Reed collection from Great American Home Store in the Memphis, TN, Southaven, MS area.